Thanks to Katie for hosting. Why does it not feel like a Monday today? Where has my weekend gone? Maybe it's because I've been ill! I feel like I lost a few too many days last week. I hope that's not the case this week, although I am going to be a busy girl with appointments and deadlines for everyday of this week. Well I guess I'd rather be busy than bored. I need to stop procrastinating also, lately I can't help but drift. For some reason I do this every time I have a deadline. This week I am going to need a lot to motivate and get me through the week. I think this week more than any other I am going to need my own space "ME" time! I haven't been getting enough lately and for me it has always been important after all I do enjoy my own company, I just need to get back to that. Lately, I have been getting lost and caught up in my own thoughts - somewhere I shouldn't dwell too long. Anyways, I want to stay positive and keep motivated - this week especially. I am definitely going to need it! So, there's a lot keeping me going this week - or more like holding me together. I'm just going through a stage or a time, whatever. I'll pull through I just hope it passes. Like soon! My goals for this week (and there are a lot), are simple - I am going back to basics like Christina Aguilera. Be prepared e.g write lists. Get to bed on time and get up consistently at a good/same time. Get a solid 8 or more hours. Don't stress (it never helps the situation). 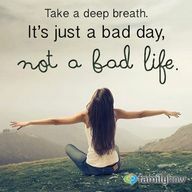 I really loved that quote - 'take a deep breath, it's just a bad day, not a bad life' I rally needed to read that today. Thankyou! No problem :D It's one of the quotes I have been loving lately! A walk is on my agenda this week too! Today especially, since it might be the only nice day of the week! Hope you are feeling all better! Thanks Katie :D Me too, being ill reminds me how well I was? If that makes any sense. Great list, and walks are totally soothing. loved all your quotes for that. We all could use that :) its awesome you have a goal and it will def help you keep focused. Have a marvelous week! March Goals - Last Day of The Month! What I've been eating lately? What am I currently eating?